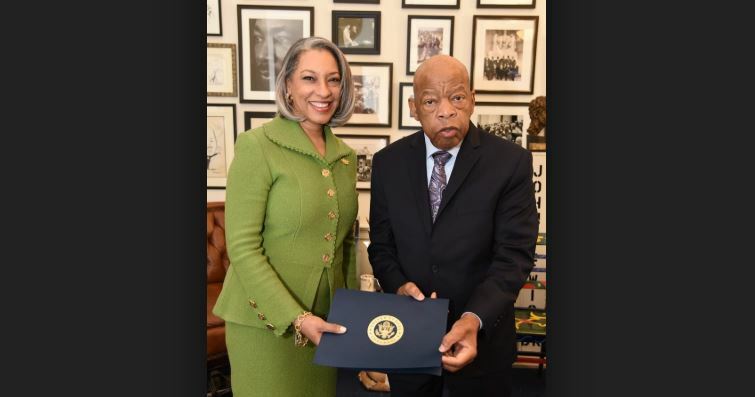 WASHINGTON/ APRIL 06, 2019 – During Women’s HERstory Month, noted civil rights icon Congressman John Lewis recognized The Links, Incorporated as a distinguished organization of outstanding community service and influence. Dr. Kimberly Jeffries Leonard, president of The Links, Incorporated and The Links Foundation, Incorporated had the pleasure of meeting with Congressman Lewis in his historic and museum-like Capitol Hill office. There, he lauded Dr. Jeffries Leonard for her dynamic, bold leadership as the organization’s 17th national president. Moreover, he praised the premier women’s organization of more than 15,000 professional women, for its integrity, courage, and accountability. While presenting the esteemed service award, Congressman Lewis further characterized the group’s work as “essential to bending the moral arc of the universe towards justice.” Dr. Jeffries Leonard shared that Congressman Lewis is a fearless trailblazer whose contributions in both the civil rights and political arenas are unrivaled. “Receiving your vote of confidence, Congressman Lewis, confirms that we are on the right track, focused on transforming lives and fulfilling our purpose,” said Dr. Jeffries Leonard. August 6, 2019 marks the 54th anniversary of the Voting Rights Act, which was signed into law by President Lyndon B. Johnson. Many brave activists, like Congressman Lewis, shed blood so that African Americans could enjoy the voting rights they have today – a right that Congressman Lewis calls “precious” and “almost sacred.” Currently voting rights in America are under attack. When asked about how The Links, Incorporated could raise their collective voices in support of Congressman Lewis’ agenda, he responded, “We need everyone to have the ability to participate in the democratic process and be able to register and vote.” The Links, Incorporated is committed to this call to action in ensuring every American has the ability to exercise their constitutional right to vote, and is proud to have seven dynamic women in Congress as active members: Congresswoman Eddie Bernice Johnson, Congresswoman Joyce Beatty, Congresswoman Val Demings, Congresswoman Sheila Jackson Lee, Congresswoman Ayanna Pressley, Congresswoman Frederica Wilson, and honorary member Senator Kamala Harris. With 288 chapters in 42 states, and in the District of Columbia, the Commonwealth of the Bahamas and the United Kingdom, the organization will mobilize, galvanize and utilize across its vast reach to coordinate with elected officials on state and local levels in preparation for the 2020 election. “It is incumbent that every American hold their elected officials accountable to ensure voting rights are protected for generations to come,” Dr. Jeffries Leonard stated.